Quang Ngai (VNA) – Three made-in-Vietnam rail mounted quayside cranes (RMQCs) are headed to India. Doosan Heavy Industries Vietnam (Doosan Vina) shipped the last batch of giant cranes to India on April 2 as part of its contract to supply 12 RMQCs to Bharat Mumbai Container Terminals Private Limited. Each crane weighs 1,480 tonnes, and is 73.8 metres high, 143 metres long and 26 metres wide. It is designed to handle 65-tonne containers. Three previous batches safely reached the Indian port in May 2017, September 2017 and March 2018. 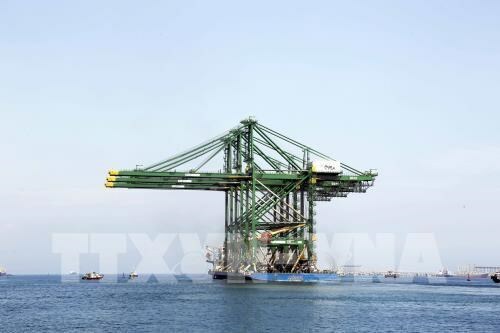 The company has manufactured and shipped 83 giant cargo container cranes to international markets, including PSA Port of Singapore, Jawaharlal Nehru Port of India and Samarinda Port of Indonesia. Located at the Dung Quat Economic Zone in the central province of Quang Ngai, Doosan Vina is one of the largest overseas manufacturing factories established through joint investment from the RoK-based Doosan Heavy Industries & Construction and Doosan Engineering and Construction.